Even in today's digital world the mainframe remains one of the most trusted elements of the IT team's arsenal. 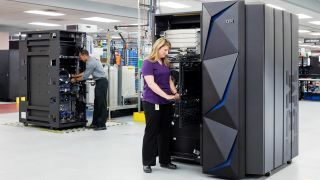 Almost fifty-five years after the first IBM mainframe was manufactured, 2017 saw the launch of the IBM z14. This mainframe continuity stands out against a backdrop of near constant change in global enterprise IT. Embracing the digital world from an organisational IT perspective isn’t easy to achieve. Additionally, it can require significant investment. In just four years, the proportion of IT budgets invested in digital systems has climbed from 20 to 50 per cent. Yet, only 5 per cent think they have mastered the task, while another 2017 survey found that 80 per cent are at risk of being left behind by digital transformation. So, it seems that while many are trying, most are frankly struggling. To achieve digital transformation, businesses need to make the most of what is already successful – building from a position of strength is a cornerstone approach for an effective, long-term strategy. As the bedrock of some of the world’s most successful businesses, the mainframe environment is no stranger to the adage that it’s often better to start with what already works when choosing the right solution. The mainframe environment has high response times, is uniquely resilient and has the ability to scale as necessary in line with business need. With this in mind, it’s easy to understand why many of the largest global enterprises – in a whole host of industries – use IBM mainframes. These organisations are constantly growing and developing. Their needs are ever-changing and evolving. Consequently, their mission-critical mainframe applications need to be kept up-to-date with modern business demands. According to a Micro Focus customer survey, plans are in place to maintain or modernise 84 per cent of mainframe applications in the near future. It is proven that modernising existing core systems by incrementally improving or adding capabilities – rather than attempting a radical overhaul – is a lower risk option for businesses. Ongoing modernisation is less costly than replacement, as it preserves the function in the current systems. Certain kinds of modernisation, such as embracing automated testing and deployment, can reduce overall costs and improve application quality. To ensure modernisation occurs successfully, IT teams will build on the existing mainframe-based COBOL systems. Sometimes referred to as ‘legacy’ systems, they have the advantage of being an incumbent system – adding value to a business over a longer period of time. There are many benefits to building upon what’s already there. Reusing IT applications in a future strategy not only shortens the effort involved, since much of the required system already works, but it is also more cost effective. To modernise means to ‘adapt (something) to modern needs or habits, typically by installing modern equipment or adopting modern ideas or methods’. Yet the term often has different meanings to different people – particularly when focusing on the IT industry. The disparity between companies’ needs, as well as the variance in what change is required, means the modernisation of mainframe needs to flexible. Supporting application innovation – This promotes the reuse of proven software assets and allows organisations to deliver new enhancements. Updating or extending business functionality through a fresh user experience or capability can often be done more quickly, with less risk and reduced costs. This can also include utilising mainframe applications alongside web service-based interfaces, or composite application architectures. Users can methodically modernise existing business-critical COBOL applications – connecting them with mobile and cloud applications. More than 65 per cent of enterprise software and 70 per cent of business transaction processing is powered by applications written in the COBOL language. For banking, insurance, manufacturing, retail, government and many other industries, these mission-critical applications deliver a unique competitive advantage. Additionally, enterprise COBOL extended the language to directly work with Java, XML and JSON. JSON is a lightweight data exchange format used by mobile applications and provides mobile applications with easy access to data and the processing they need from business-critical enterprise COBOL applications. In today’s mainframe world, application modernisation is at a developer’s fingertips. At the core of a connected infrastructure – In order to achieve a connected ecosystem, there needs to be an IT infrastructure with seamless integration across all parts of an organisation. Businesses need to be able to apply the correct resources in the right places. Whether mainframe applications are being executed in a virtualised or hybrid IT environment, modern mainframe systems have the flexibility to do either. In fact, many are investing in additional capacity thanks to the proliferation of cloud and today’s multi-cloud reality – organisations want the two to work in conjunction with one another, ensuring connectivity isn’t compromised. Nimble and adaptable – The IT department needs to be able to breathe new life into the mainframe – providing agile development alongside the flexibility to implement change and adapt, regardless of constraints and circumstances. Multi-platform DevOps is a viable approach to the mainframe; by combining agile and DevOps with a unified and collaborative development and delivery environment, mainframe technology can become part of the new generation of rapid application delivery. As an example of this, Arcati recently reported that two-thirds of the mainframe world is utilising DevOps, which explains why it is such a popular track at the SHARE mainframe community gatherings. For the next generation IT team – Ensuring your workforce is mainframe-ready is essential. After all, technology will only do what it is instructed to do by a human team. To help develop the next generation of digital and IT skills, mainframe vendors have called for – and advocated – an approach that unifies disparate IT skills with modern technology. This approach allows the next generation of IT workers to acquire technical skills across the board, with all systems, including the mainframe. A secure future – IBM has invested in pervasive encryption technology, to ensure the z14 is secure straight from the box. When combined with other mainframe software innovations, a heightened level of security can be achieved – whether that’s using multi-factor authentication, or security solutions integrating social, cloud and back-end data. Modernising a trusted, valuable mainframe-based IT system is a sure-fire route to success. It delivers a variety of viable options, irrespective of the drivers for change within an organisation. Looking at all of the benefits of mainframe technology, it’s easy to see why enterprises continue to rely on one of the most trusted elements of the IT team’s arsenal. Little wonder that recent market results suggest a resurgence in the popularity of the mainframe. At the end of the day, the mainframe is here to stay.